Little did Steve Cragg know, when he opened a bag of Cheetos, he was about to find Jesus. The youth director at Memorial Drive United Methodist Church in Houston was, naturally, shocked and pleased to discover his Lord and Savior in the bag of delicious cheesy snacks, though he's not certain it's technically a miracle: "If you're looking for God in different places, you can find God in different places. 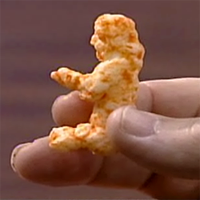 … I don't think God makes Cheetos that look like Jesus. I'm not sure he does grilled cheese sandwiches that look like the Virgin Mary. I do know that God reveals himself to us in a lot of different ways." 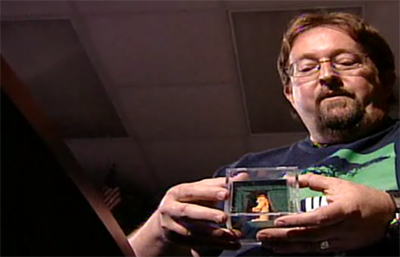 And when He does, miracle or not, it's best to put that holy revelation in a nifty wee display box and for all the world to see. Or cover it in 20 coats of polyurethane and send it on adventures all over the world. Just, whatever you do, keep it away from the cat.